First off I just wanted to say that I have been having an absolute blast ever since I joined the biking crew in Americus, Ga. and today was no different. This will be my fifth day of riding with the group and let me tell you, this morning was definitely the hardest of all the days to get out of bed. I’m not used to biking a whole lot and my body is definitely letting me know that right now. However after I managed to get up we got off to a great start thanks to Brett, Kyle and one of our new riders Dave who made us some eggs and bacon which were given to us by the Church of God of Eastpoint. Then after another inspiring devotion by Ryan we were off on our journey to Panama City. The journey began with a nice ride over the bridge connecting Eastpoint to Apalachicola. It offered an amazing view of Apalachicola Bay and was another one of many breathtaking scenes that we have seen on the trip. That’s been one of my favorite things about the ride so far–being able to see the amazing beauty that God has created all around us and getting to be a part of it every day. After crossing the bridge it was a pretty uneventful ride for a while as we continued about 60 miles on 98 West, which is very straight and at times seemed never-ending. But it was a very beautiful route nonetheless. Things got a little more interesting once we arrived in Panama City and made our way to the church. The roads were fairly busy–probably the busiest I’ve ridden on so far. We did have one accident which involved Aaron, who you all finally got to meet yesterday in his blog. While riding he was clipped by the mirror on a passing van, however he came away fairly unscathed due to a nice patch of grass, he just re-aggravated his wrist a little which he injured early in the trip. We finally all arrived safely to Lighthouse to the Nations church located in Panama City. I was absolutely amazed by the youth/fitness ce nter they had there. That part of the church is called the Lord’s Gym and they have a big weight room, a basketball court, a little hang out area which has a smoothie and coffee stand, and music playing throughout the place. A few others and I went and worked out a bit in the gym. It was the second time this week we had access to one, so that has been great. Also while there we were able to speak to the local newspaper and two TV stations, so if you get a chance you should check those out. After that Dave, who lives in Panama City, took us to his house and we were able to shower up and lounge around a bit on his back porch which had a very nice view of the waterfront. Next we went and had amazing lasagna, soup, bread and other things for supper at Grace Episcopal Church. I would like to give a big thanks to Dave, Sayre, Tom, John, Connie, and Marsha for inviting us to their church and for the great meal they provided. They were very fascinating people and it was nice getting to know them. I just want to continue to say thanks for all of your support, prayers and donations. I am looking forward to another adventure tomorrow as we travel to Fort Walton and are joined by three more riders! Help Allen exceed his $2,000 fundraising goal by clicking here! Game time!! 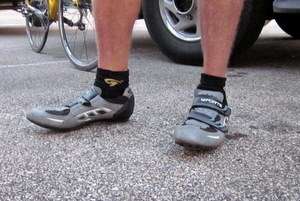 Can you match the cleats/tennies to the correct rider?? E-mail kyoder@fullercenter.org your best guesses. Those who submit correct answers will receive…a link to something awesome! Look for more fun games tomorrow. I love the game! But I’ve been on the trip 6 weeks and wouldn’t be able to get it right. I sure hope that is really one awesome link that Kelli will send you to!